Madonna turns 60 on Thursday. To celebrate, we’re taking a look back at her 35 years in the industry. Since Madonna’s eponymous debut album hit the shelves in 1983, she’s performed on 10 concert tours and sold more than 300 million records. This has earned her a spot in the Guinness World Records as the best-selling female recording artist of all time. What else can a look at the numbers tell us about the Queen of Pop? Twelve of Madonna’s albums have hit the number one spot. Only the Beatles and Elvis Presley can boast more. Greatest hits album The Immaculate Collection spent a 338 weeks in the charts after its release in 1990 – including more than two months at number one. Like A Virgin your favourite Madonna tune? Join the crowd: Spotify data ranks this 1984 classic as her most popular song. In fact, only one song in the top five is not from the 80s: Hung Up from 2005. 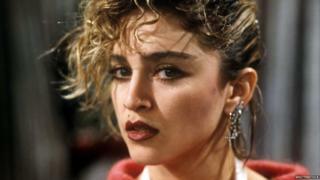 Madonna’s had 46 singles make the top five in the UK charts – only Elvis has had more. The hits span three decades, from Like A Virgin in 1984 to Celebration in 2009. Obviously, Google wasn’t around to tell us what people were curious about back in the 1980s. But since 2010, global searches for Madonna reached their highest point in March 2012, when she was the Super Bowl’s first female headline act since Janet Jackson had her “wardrobe malfunction” in 2004. In 2012, Madonna set a record for the highest viewing audience of a Super Bowl halftime show – which lasted until 2015 when it was smashed by Katy Perry and ‘Left Shark’. Most streaming services give songs a numeric value to determine if it’s a “happy” or “sad” song, based on its key, tempo and other factors. It only measures how the music sounds – and ignores the lyrical content – but uses this information to auto-recommend new music to us. So looking at how Spotify’s computers “hear” her work, they would classify it as getting “sadder” over time, with slower songs and more minor keys being used. Clearly this is far from the whole story – machines can’t (currently) understand the words and “feel” songs in the way we do. Some of Madonna’s deepest, most emotional work is actually on her early albums, despite those records sounding more “happy” overall. True Blue from 1986 ranks among the “happiest” sounding, despite songs covering teenage pregnancy, deceit and parental estrangement. And while 2012’s MDNA and 2015’s Rebel Heart both sound “gloomier” to a computer, songs such as Give Me All Your Luvin and Girl Gone Wild are lyrically anything but. So streaming services have a way to go before they can reveal more to us about a song than just its sound. Madonna’s studio albums feature songs in 24 different keys – but G major is the most common, with 17 songs employing it. Looks like she really is a Material Girl. Forbes estimated Madonna’s net worth at $580m (£454m) last year, making her the richest female artist based in America, comfortably $200m (£157m) ahead of runner-up Celine Dion.